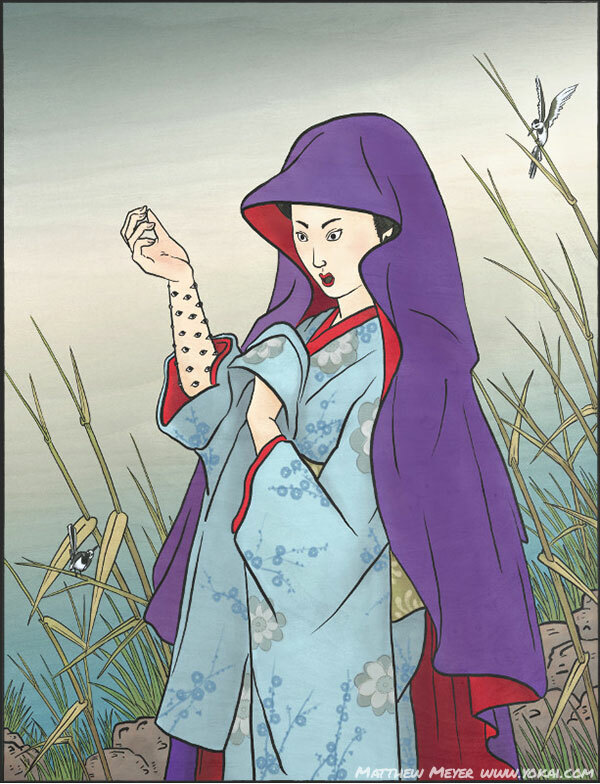 APPEARANCE: Dodomeki are cursed women with very long arms covered in tiny bird eyes. They were once human girls who developed a penchant for stealing money. Because of their wicked actions, one day hundreds of tiny bird eyeballs sprout out of their arms and they transform into this monster. ORIGIN: When Toriyama Sekien first described this yokai, he inserted a number of puns. The dodomeki is described as being a woman with long arms — having “long arms” in Japanese is a figure of speech meaning somebody who likes to steal a lot. Thus, the dodomeki has long arms, both figuratively and literally. The copper coin, or dōsen, had a hole in the middle of it, and was colloquially known as a chōmoku, or “bird’s eye,” due to its shape. This play on words is the reason that this yokai grew birds’ eyes as a result of stealing copper coins. Money was also sometimes referred to as oashi, or “feet,” because it comes and goes as if it had its own feet. LEGENDS: Long ago, in what is now Tochigi prefecture, lived a nobleman named Fujiwara no Hidesato. He had just been granted the title of kokushi of Shimotsuke province for his valor in defeating the rebel Taira no Masakado. One day while hunting in his newly acquired countryside, Hidesato was approached by an old man, who warned him that some kind of oni had been sighted at the horse graveyard at Utsunomiya. Hidesato grabbed his bow and arrow and went to investigate. Hidesato reached the horse graveyard and waited until nightfall. When the hour of the ox came, an enormous demon appeared and ravenously began devouring horse carcasses. The demon stood over ten feet tall, had sharp, spiked hair, and was covered in glowing eyes all over its body. Hidesato carefully aimed an arrow at the brightest glowing eyeball and fired. The arrow hit its mark, and the demon roared in pain, fleeing into the woods until it finally collapsed at the foot of Mount Myōjin. The battle was not over, for although the demon was near-fatally wounded, it still had power left. From its body erupted a torrent of flame. Its mouth split open and poisonous fumes spewed forth. The toxic air and intense heat proved too much for Fujiwara no Hidesato, who had to give up and return to his palace. When Hidesato returned the next day, the ground was blackened and burnt over a large area, but there was no sign of the demon. 400 years later, during the Muromachi period, the dodomeki finally reappeared. A village had sprung up on the northern slope of Mount Myōjin, and strange things had begun happening. The temple’s head priest had been suffering mysterious injuries and unexplained fires began to break out at the temple. A new head priest, the virtuous and holy Saint Chitoku, was called to discover what the cause of the strange problems was. Saint Chitoku noticed that one young woman stopped by the temple frequently whenever he preached his sermons, and recognized it as the dodomeki in disguise. The demon, terribly wounded, had retreated into some caves nearby to heal. 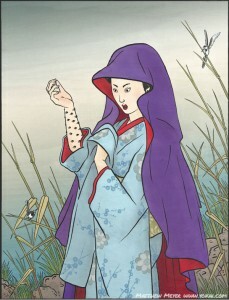 It transformed into a young woman, and had been visiting the site where it fell, gradually sucking back up all of the noxious fumes that it had breathed out, and collecting all of the blood that it had bled in the battle with Fujiwara no Hidesato. The village temple had been built on top of the battle site, and the dodomeki caused the fires and attacked the priest to scare them away. One day, Saint Chitoku confronted the demon in disguise, and she finally revealed her true form was a dodomeki. She did not attack him, however; while frequenting the temple, she had overheard Chitoku’s powerful sermons, and they had stuck with her. The dodomeki promised that she would never again commit any act of evil. Since then, the area around Mount Myōjin has come to be known as Dodomeki.